Instagram is the latest fad enjoyed by every second individual available on the planet earth. As a user, Instagram, lets you speak about yourself from a different perspective, which is chic, classy and trendy too. Instagram is a mobile photo-sharing application, letting the users share pictures and videos and sharing them to various social media platforms like Facebook, Twitter, Tumblr, and Flickr. The most recent and exciting change made at Instagram lately had been that users could post multiple videos and images in a single post. Also, users have the advantage of sharing up to 10 photos or videos in a single post. This feature lets the followers see the all post by swiping from side-to-side. User can also tap and hold to change the order of the images or videos and can set the individual filter and manual editing options, but the most trending news, which is rounding the internet is that now apart from sharing the images and videos, Insta users would be able to save their own live videos at the end of the broadcast. On the completion of the live video, the user needs to simply tap ‘Save’ button, in the upper-right corner and the video will be saved successfully on the mobile device without any hassle. User needs to remember that only the videos gets saved, but not its comments like or any other live interaction. 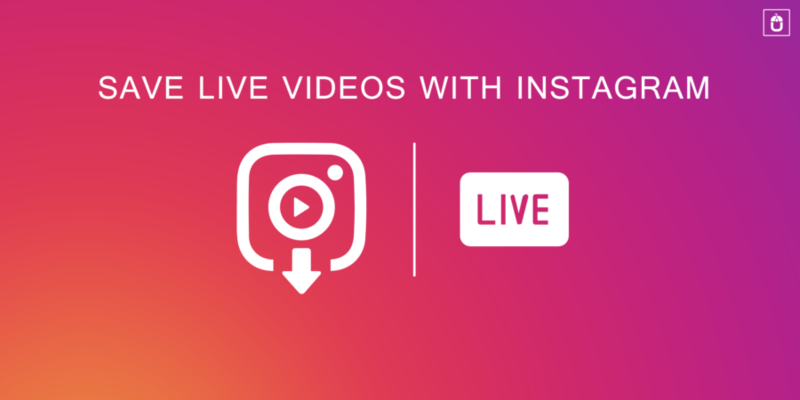 This live video saving feature would be a part of an update to Instagram for both Android and iOS users and the upgrade will bring the Instagram app version to 10.12. On the other hand, if you are looking for an app developed specifically for your business, then you are at the right place, which is Techugo- a top mobile app development company. At Techugo, we take pride in developing the mobile apps for the leading brands to startups and our mobile app development team has the expertise to create a unique variety of mobile app solution for your business needs, which would help you to showcase your idea, goal, and dream in the most informative and engaging way. Our team of top mobile app designers is here to help assist you with every step of your mobile app development strategy. We consult, brainstorm, manage the project, design, develop, test, launch, and market apps in the best possible way.